For courses in literary criticism or literary analysis. 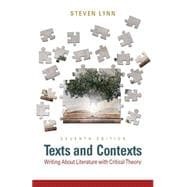 By considering how adept readers behave and what assumptions they might make while interacting with literary text, Texts and Contexts: Writing About Literature with Critical Theory teaches students the challenging art of writing about literature. The Seventh Edition provides overviews of literature and how to write about it, as well as critical and literary theory with examples throughout. Students will learn versatile strategies in reading, writing, interpreting data, and constructing arguments that can be applied to virtually any field. Cut through the anxiety, the unknown, the hassle . . .